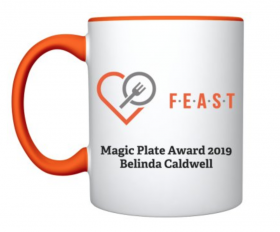 There will of course be MUCH to report and discuss and brag on and process about the past week, but it is appropriate to start with this first: CONGRATULATIONS to our Belinda Caldwell who was awarded the 2019 Magic Plate Award, presented by Rachel Polonsky and F.E.A.S.T. Advisor, Rod McClymont, at FEAST of Knowledge in New York. For her service to F.E.A.S.T., and her extraordinary advocacy in Australia, we so appreciate you, Belinda. And, yes, it’s a cup not a plate. But we figured you could actually use a mug and who wants to carry a pewter plate on a plane! Thank you, Belinda, and congratulations!! Previous Previous post: The Mayor of New York City Welcomes F.E.A.S.T.’s FEAST of Knowledge Today!